Nothing says camaraderie in war like a tattoo among the troops! 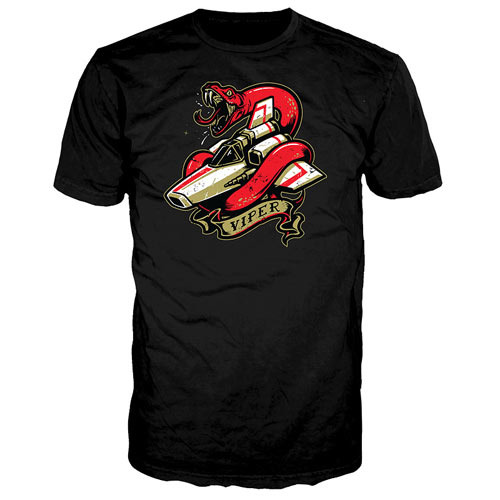 The Battlestar Galactica Viper Tattoo Black T-Shirt ups the ante with a powerful scarlet viper coiled around a Colonial Viper Fighter craft - rendered in a tattoo-style apparel design that's bound to be a real conversation-starter. This fantastic tee pays homage to the late Norman Keith Collins, a renowned American tattoo artist who was also known as Sailor Jerry. In the style made famous by Sailor Jerry, this great t-shirt features bold lines, and Asiatic color palette, and fine detail. Because snakes were one of Sailor Jerry's favorite symbols, the wraparound viper is a special tribute to the 20th century tattoo mastery. Wearing this popular tatoo style couldn't be more painless - or fashionable!